Last month, after more than a year of intense negotiations, United Nation member states, except US and Hungary, agreed on the first-ever Global Compact for Safe, Orderly and Regular Migration. The pact aims to address the challenges of international migration, strengthen migrant rights and provide a platform for cooperation. In the current scenario, it is a significant achievement as the pact has the potential to change how the world approaches migration – one of the most politically debatable issues today. There is stark contrast between the academicians view on migration which is backed by economic evidence and the public discourse on migration that in most cases shapes the political agenda. On one hand, migration is considered to pave way for growth and prosperity for both immigrants and the host country. For migrating individuals, it is the most effective way to reduce poverty. A World Bank study mentions that migrants’ incomes increase three to six times when they move from lower- to higher-income countries. The average income gain for a young unskilled worker moving to the United States is estimated to be about $14,000 per year. Similarly, research suggests that if 100 million young people migrate from developing to developed countries, it will increase the host country’s GDP by $1.4 trillion, thus bringing prosperity to the nations. On the other hand, despite compelling economic evidence, there is strong political opposition to immigrants in many countries. This opposition comes from the view that immigrants scale down jobs for the citizens, drive down the wages by creating competition in the market. The labour market concentration of immigrants creates anxiety and insecurity in the mind of native born workers as immigrants are ready to accept low wages and can work in more demanding work conditions. Destination countries often blame immigrants for their economic woes and accuse them of the displacement of native-born citizens from their jobs. This is the reason that immigration was one of the top three concerns during the last round of elections in the United States and every Western European country. It is important to acknowledge that studies do show a displacement effect among the citizens. The concentration of immigrants in certain destination countries, occupations, and regions driven by market forces i.e. to fulfil unmet demand is the main cause of the economic problems and cultural anxieties of local populations. However, this impact is limited to low skilled and less educated workers where substitution is easy. In fact, the group of native born citizens that do not compete directly with immigrants experience significant economic gains. Also, the displacement costs are outweighed by the economic benefits generated for the destination country by labour mobility. The evidence sheds light on the fact that immigration has unequal effects. It benefits workers in high-skilled jobs that are characterized by knowledge spillover and skill complementarities and creates huge costs for low skilled workers who mainly belong to the low and lower middle-income groups. This section of the society is already vulnerable, and any economic shocks can drive them below poverty line. This is the reason for strong political opposition to immigration. However, changemakers should realize that ceasing the incoming immigrants in the destination country won’t serve as a justification to the economic growth. For instance, The Penn Wharton Budget Model, capturing the economic impact of RAISE (a policy aimed towards reducing immigration levels by half) on US GDP, projected that a 50 per cent reduction of legal migration will reduce the US economy by two per cent and 4.6 million jobs by 2040. Similarly, countries like Vietnam, Thailand, Singapore and Malaysia that were predominantly labour scarce, have brought drastic transitions in the structure of their economies from primary to secondary and tertiary sector, through the adoption of friendly immigration policies. It is critical to adhere to correct policies that are designed after addressing the legitimate economic concerns. The policymakers should work towards the twin goals of accruing maximum benefits from labour mobility and addressing the concerns of the displaced workers. Programs can be designed to aid the low skilled native-born workers to adjust with the changing scenario. Assistance mechanisms for displaced workers can involve skill development and training, transitory welfare benefits and unemployment insurance payments. The financing of such assistance programmes can be partially done by taxing the beneficiaries. 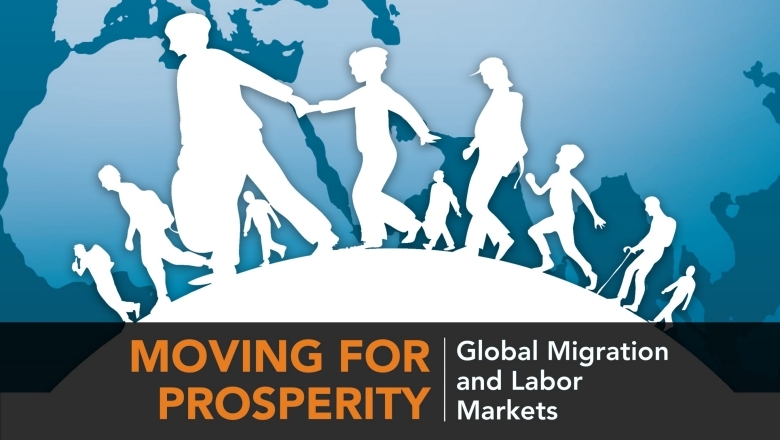 Policymakers should keep in mind that though rising immigration raises questions concerning displacement of native-born workers and economic constraints, the path to liberal migration with clearly designed immigration policies can facilitate economic integration and economic growth in the long run.